(CNS): Although police have not yet revealed if any charges have been brought against the 31 year old man who was arrested in the early hours of the morning over a loaded gun, officials have released a picture of the weapon (left). 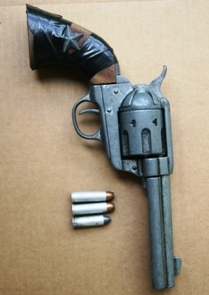 Following the police operation in the early hours of Monday morning 13 June in the North Side area Detective Superintendent Marlon Bodden said represented the continued police commitment to get firearms off the street. The seizure comes ahead of a planned gun amnesty which will be starting on 1 July which police said was just one strand of the overall strategy to reduce gun crime. (CNS): As he wrapped up his long awaited 2011/12 Budget presentation in the Legislative Assembly on Friday night the premier revealed government’s intention to partner with the Dart Group in the upcoming financial year to drive Cayman’s economic recovery. McKeeva Bush said Cayman couldn’t rely just on worldwide economic growth but needed to look for public-private sector partnerships at home to boost the economy. He said government proposed to establish a partnership agreement with the developer of Camana Bay, which the premier said would facilitate infrastructure projects without incurring debt. The premier revealed that Dart would be completing the West Bay road by-pass up to Batabano as well as moving a stretch of the West Bay Road near the Public Beach and the former Courtyard Marriott, which Bush said Dart would also be renovating. The premier further announced that Dart would be constructing and operating at least two more hotels across Grand Cayman. “These will be brand aligned and will enhance the tourism product to consolidate the destination’s leadership position in the Caribbean,” he added, but did not say exactly where these hotels would be situated. Bush also spoke about a masterplan to fund and deliver much needed infrastructure projects as well as the roads. This would include the extension of the Public Beach area on Seven Mile Beach as part of the development of the derelict hotel, which was recently purchased by Dart from Texan developer Stan Thomas. The premier said Dart would enhance the existing facilities and add a public park. The proposal for Dart to move the road in that area to create a beachfront resort on the land has already caused controversy with residents in West Bay. A group of residents recently met with Dart to express their concerns, not just about the plans to move the road but about the removal of public access to Seven Mile Beach. They were reportedly assured by the developer just a few months ago that there were no immediate plans to move the road or prevent local access. Concerns have also been raised about which crown land government proposes to swap with the Dart Group to facilitate the development of the new Seven Mile Beach resort. Other potential controversies were also revealed by the premier when he stated that Dart would now fund and deliver a modern solid waste management facility at a new site on Grand Cayman and not just cap and remediate the existing George Town landfill. Although he had already announced that Dart would be tackling the current dump site and turning ‘Mount Trashmore’ into a possible leisure area within Camana Bay in exchange for land that would be given to government to use as a new landfill, this is the first time government has said Dart would be funding and delivering the new landfill site. He did not state, however, whether the developer would be operating the waste management process in partnership with Wheelabrator, which had won the tender last year, or another waste-management firm. Wheelabrator was awarded the contract following an official tendering process last year but CNS has been told that there have been no meetings between ministry officials and the bid winner since January, when the premier first announced that Dart would remediate the George Town landfill. It has still not been made clear where exactly the new landfill site will be or what, if any, role Wheelabrator and its local partner will play in the country’s future waste management plans. The international waste expert had won the contract based on plans to mine the existing dump and generate a waste-to energy facility at the site as a way of dealing with the islands’ growing waste problem and in turn funding its investment. Bush said that the objectives of this proposed agreement with the Dart Group to partner with government to develop public infrastructure as well as new hotels were to create jobs for Caymanians in the short, medium and long term across a number of sectors, as well as stimulate the Cayman Islands economy. “The Dart Group has very significantly contributed to the development and economic growth of our country,” he said. “The total economic impact to the Cayman Islands from their Camana Bay project has been estimated at approximately US$826m. They have demonstrated through their charitable activities and contributions — which exceed US$30 million in the last decade alone — that they are committed to helping make Cayman a better place for this and future generations,” Bush added. (CNS): Police are investigating the circumstances surrounding an assault which took place at around 3.30 pm yesterday, Monday 13 June in a local supermarket. A police spokesperson confirmed that a report was made to law enforcement officials that an altercation had take place between a man and a woman inside Fosters Food Fair- Airport location. The woman was taken to hospital following the incident and released following treatment. 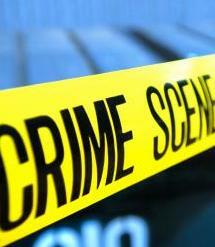 The incident reportedly took place near to cash out area in front of a number of shoppers and staff. Despite witnesses indicating that the woman appeared to have been badly hurt no arrests have been made and police said enquiries into the matter are ongoing. Anyone wishing to report any criminal activities can call the George Town Police Station at 949 422 or the anonymous Crime Stoppers number 800-8477 (TIPS). (CNS): Anti-tax evasion activist groups in the United States are planning their next move in their campaign to to draw attention to corporate tax evasion and what they believe is lost revenue for tax coffers with a trip to Cayman. US Uncut and The Yes Men have launched a Kickstarter account (an on-line fund raising service) to help raise $10,000 by the end of this month to fund a fact finding mission to the Cayman Islands. The campaigners said that they intend to hire a video crew and head down to Cayman to see if they can get to the bottom "of the world's best kept tax secrets". The tax campaigners say that public services in the States should not be suffering cuts when they believe tax revenue could be sourced offshore. With over two weeks still to go the group had managed to get just over US$1,055 in the first four days. The campaigners have also produce a spoof brochure for their 'Citizens Tax Cruise' trip with essential stop-offs on the tour. This latest move comes on the heels of a spoof press release circulated in April by the activists from GEC which said the US corporaiton intended to donate its entire $3.2 billion tax refund to help offset cuts and save American jobs. Premier Bush said in his budget address that he plans to cut fuel taxes for fuel used by CUC in order to allow a reduction in residential electric bills. This is a move in the right direction but too little to do the big job that government is seeking with respect to increasing revenues through increased public spending. A simple Google search on "electricity costs and GDP" is a real eye-opener. Study after study reveals clearly that electricity costs are inversely proportional to GDP. As the price of electricity is decreased to the consumer, GDP goes up in all cases. Therefore, with such a large amount of data available to substantiate this, why doesn't the premier extent the reduced electricity rates to business an commercial users as well? 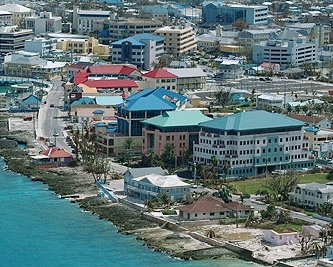 Cayman has 11 public holidays in 2011 along with 52 Sundays. This means that the local supermarkets will be close for about 18% of the year and they have to keep the freezers and air conditioners on even though they are closed and cannot sell the food to earn revenue to pay the electricity used. Therefore, they have to charge more for food to make up for the expense of keeping cold when they are closed, which as I said is about 18% of the possible shopping days in the year. Cayman observes Sunday closings and we are willing to pay the extra high prices for this observance. So would it not make sense to likewise extend electrical rate cuts to the supermarkets in order to further increase our spending power? The entire content of the budget speech was in reference to GDP and our expected shortfall of 147 million dollars this year. Why not wake up and get with the program and start reducing the cost of living here across the board so that we can begin growing again? Another consideration to support removing taxes and duties on CUC fuel is that this plant is 100% dependent on oil. Unlike other major economic jurisdictions which have many other forms of energy such as nuclear, wind, solar and ocean, we have failed to prepare for the future in our energy needs and will be held hostage to the price of oil when supplies begin decreasing and prices escalate. Oil experts agree that the current large oil wells in the Middle East have past the halfway mark in oil remaining in the ground. Eventually, the world will suffer oil shortages which will drive the price of oil to levels that even we cannot afford. And then our GDP will be down the drain. NOW is the time to kick start growth by removing all fees on CUC and getting the cheapest electricity possible. Another side to electricity cost in Cayman is how efficiently the finances of CUC itself are being managed. I'm all for supporting local charities but I don't think we should rely on our electric company to spend a portion of our electric bills on banners, TV advertising and the like. It is a utility and a monopoly as well. No advertising needed. By trimming their excesses and lowering cost to the consumer, the economy will thrive which will allow for the normal support of charities by the public. Insanity is when you repeat the same mistake over and over and expect a different outcome. So far, the policy of ever higher duties, fees and taxes is making things worse. It is time to remove the noose and let the economy breathe. (CNS): The local power company on the islands of Turks and Caicos have disconnected power to a number of government buildings and facilities. According to reports in the local media Provo Power Company (PPC) has disconnected offices and some schools in Providenciales and South Caicos because the government has not paid several thousands of dollars in power bills. The Turks and 'Caicos Sun reports that the government and the power firm are currently in talks to resolve the matter. The country's Immigration and Customs office was said to be effected preventing them from processing document and parents who dropped children at government primary schools were told to take them home because there was no power. With exams taking place at the country's Clement Howell High School, however that school was not disconnected. 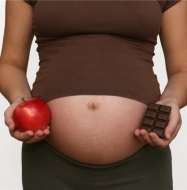 (ScienceDaily): A high-fat diet during pregnancy may program a woman's baby for future diabetes, even if she herself is not obese or diabetic, says a new University of Illinois study published in the Journal of Physiology. "We found that exposure to a high-fat diet before birth modifies gene expression in the livers of offspring so they are more likely to overproduce glucose, which can cause early insulin resistance and diabetes," said Yuan-Xiang Pan, a professor of nutrition. The high-fat diet that caused these changes was a typical Western diet that contained 45% fat, which is not at all unusual, he said. (CNS): Open water swimmer Penny Palfrey has hit the headlines the world over following her astonishing marathon swim this weekend. The 48-year-old British-Australian woman from Townsville, Queensland, has set a new record for an unassisted solo ocean swim by completing the more than 68 miles or 108 kilometres between Little Cayman and Grand Cayman. In the water for more than forty hours and forty-one minutes non-stop and followed by white tip-sharks, Palfrey’s swim was not only an incredible feat of endurance but pretty dangerous as she said one shark cruised under her throughout the night. Palfrey told ABC Radio she was well aware of the sharks, known for their aggression. "One of the white tip sharks, it just shadowed me the entire night – I could see it sort of five feet away, maybe more," she said. "I had the (electronic) shark shield on so it was just outside the range of the shark shield and it was just cruising underneath me all night long." To qualify for the record Palfrey, a mother of three, had to make the swim without a wetsuit or shark cage and stay in the water for breaks. She finished the recorded breaking ocean journey severely dehydrated with a swollen tongue unable to speak. She was taken to hospital for observation after she collapsed once she had made it to the beach in the East End of Grand Cayman and given the cheering crowd a wave of acknowledgement. 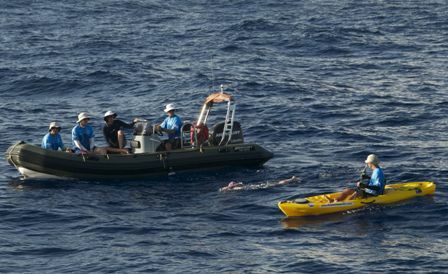 Steven Munatones, a swim adviser and observer for the International Marathon Swimming Hall of Fame, said that the last few miles were tough going for the endurance swimmer. "What Penny did physically and psychologically was beyond incredible," he said. “She was weak and her arm strokes were just slicing through the water … she wasn't moving that fast but she just hung with it." Sharks twice came within about 33 feet (10m) of Palfrey, one reportedly as much as nine feet long, and she was also stung three times by jellyfish. After a much earned rest Penny is understood to be staying in Cayman for the rest of the week and will be taking part in the more sedate one mile Flowers sea swim next weekend. (Bloomberg): Very obese older men hoping to live longer may be let down by a new long-term study that found weight-loss surgery didn't increase survival for people like them — at least during the first seven years. 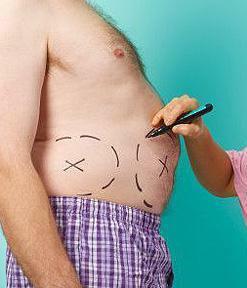 Prior studies have found stomach stapling and other obesity surgeries improved survival rates after two to 10 years. The new study in mostly older male veterans suggests one of two things: Not everyone gains equally from surgery, or a survival benefit may show up later in older men, after more years of follow-up. The patients' organ damage from obesity could have been too far along for weight loss surgery to reverse it, some experts said. "Nearly all prior studies have found bariatric surgery to be associated with reduced mortality. But those studies were conducted on very different patient populations using less rigorous methods," said lead author Matthew Maciejewski of the Veterans Affairs Medical Center in Durham, N.C. Evidence has been mounting for the health benefits of obesity surgery, so the new results may surprise some people. U.S. doctors now perform more than 200,000 obesity surgeries a year at an estimated cost of $3 billion to $5 billion. Schauer said a definitive study on survival could cost $200 million. 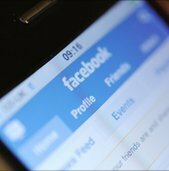 (BBC): A juror, who contacted a defendant via Facebook, has admitted contempt of court in the first case of its kind in the UK involving the internet. London's High Court heard that Joanne Fraill, 40, contacted Jamie Sewart, 34, who had already been acquitted in a drugs trial in Manchester. However, the jury was still considering charges against other defendants and the contact led the judge to discharge the jury, and the case collapsed. The pair face up to two years in jail. The case, brought by the Attorney General, Dominic Grieve QC, is being heard by the Lord Chief Justice, Lord Judge, and two other judges. Fraill admitted she had made online contact with Sewart and discussed the case with her while the jury's deliberations were continuing. She also admitted revealing details of the jury's deliberations during that online conversation – contrary to Contempt of Court Act 1981 – and conducting internet research into a defendant whose case she was trying as a juror during the trial.